Water-colour of a road through a pass, near Kaitee, Udagamandalam (Ootacamund) painted by George Hutchins Bellasis (1807-1862) in March 1852. 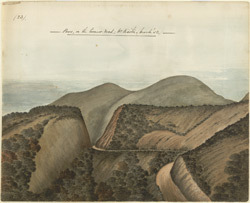 Inscribed on the front in ink is: '(23) Pass, on the Coonoor road; Nr Kaitee. (March '52)'. This view depicts the characteristic green, rolling downs of the Nilgiri Hills in the south of India. The scenery is reminiscent of much of Europe and Udagamandalam became a popular resort for European people escaping the heat of the Indian plains in the 19th century. Udagamandalam became the summer headquarters of the government of Madras from 1861 onwards. It was also regarded as having a healthy atmosphere and became a popular sanatorium and retreat for invalids.